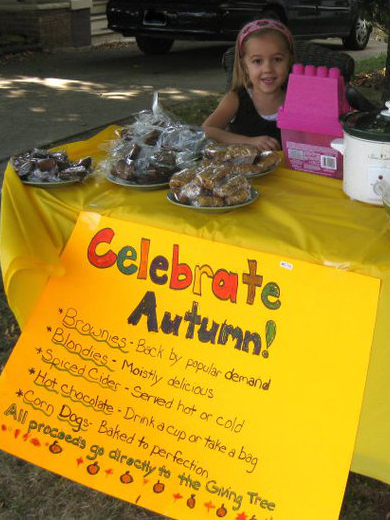 We’ve all seen the classic lemonade stand, but something a little more unique is an Autumn Food Stand, complete with hot chocolate, cider, and freshly baked goodies. My daughters and I have had these together and we’ve learned a lot of ways to make it successful. There’s no need to spend money on tables, signs, and food. Just look around your house and see what you can “borrow” for the stand. We put our for-sale items in baskets or on dinner plates, and we’ll cover our table with a party tablecloth that’s left over from a previous event. The items we sell vary depending on what we have on hand. A brownie mix in the pantry means we’ll sell fresh baked brownies. Frozen or refrigerated cookie dough can be popped into the oven as well. We’ve made our own hot chocolate mix and baked brownies from scratch for previous food stands and while our customers loved that, it didn’t increase sales, so the extra prep time involved actually cut our profit-per-hour in half. 3. Make your stand cute. Having a colored tablecloth and a sign hanging in the front of the stand are good. Balloons or little pumpkins on or around the table are great. Coming up with a cute name for the stand is a fun touch. 4. Clearly list prices on the sign. People in our area won’t pay more than $1 per item. Items priced at $0.50 or less sell even better. 5. Enlist your children’s help. My daughters sell much more than I can. When they step away from the table, people drive right by even if I’m holding my daughters’ spots for them. We attract sales when they’re at the table and ready to sell. I keep my kids in their seats by bringing coloring books and crayons outside, offering complimentary cookies when they start to look tired, and singing songs with them when the sales are slow. If you don’t have children, borrow a friend’s child, make an afternoon of it, and share the profits! We live on a quiet street, and I decided that we could easily double our profits if we had a busier location to sell. I found a spot, received permission, lugged our gear over, and…. watched the cars whiz by (in a 35mph zone). We ended up making less per hour than we make when we set our stand up in front of our house. 7. Pay attention to the weather. Hot chocolate and hot tea don’t sell well when it’s 85 degrees outside. Nothing sells when it’s raining. On weekdays, we’ve found that we make the most money from 4 to 6 p.m. Sales on Saturdays tend to trickle in all day. This probably goes without saying, but keep your kitchen and hands clean while making the food. Wrap everything in advance by placing individual items in plastic wrap or placing two goodies into each snack bag. Keep a bottle of hand sanitizer on the food stand table, and let the customers see you wash your hands before touching food or drinks. We make more sales when we sell large cups of lemonade or hot chocolate for $0.50 than we do when we sell small cups for $0.25. We also sell cookies better when we put two in a baggie for $0.50 than when we wrap them individually for a quarter. When we offer half priced refills on drinks, most people will drink two cups. We always offer a buy-four-get-one (or two!) free deal. People generally take us up on that offer, and then leave a tip. We don’t advertise for these sales. We just set up when we’re ready and let the cars stop when they see us. I can plan on making about $10 per hour when we have a food stand. We spend about an hour of prep time, two hours actually hosting the stand, and just a few minutes putting things away when we’re finished. After we subtract supply costs, we usually end up with $30 or so in profit. Note from Crystal: Some areas have strict laws concerning selling food. Before setting up a food stand, please check local ordinances to make sure it is allowed in your area. Have you ever had a food stand before? If so, I’d love to hear your tips, ideas, and suggestions. Davonne Parks is an author who is passionate about striving to make the most of her time, using her talents for good, and inspiring others to do the same. She blogs at DavonneParks.com and she just released her first eBook, 28 Days to Timeliness: Tips and Confessions from a Semi-Reformed Late Person. My 4 year old just set up a stand during our Yard Sale last weekend. She sold muffins and cookies (from Costco), and water bottles. After taking out supply costs, she made a profit of $30. Not bad for 2 hours work! I’ve heard some towns have gotten tough on lemonade stands- ie needing permits or to follow health department regs. Has anyone run into this? Yes, where I live you need permit to open curb-side stands. If the police happen to cruise by, they’ll shut you down. They don’t care what the cause it or how old you are, permit ONLY. We had a lemonade stand set up at our garage sale once. Our city required a permit, so we made it a free lemonade stand, donations accepted. Our boys wound up making more money than if they had charged by the cup! Only a few customers opted not to donate. That’s a great idea! Thank you for sharing it! We have not run into this – you could call your city office to double check. My county is very strict. I would need a certified kitchen and a food-handlers license, and probably a business permit too in order to have a food stand. Even produce stands are required to have a 3-stage sink and food handlers license if they’re going to slice open a cantaloupe for samples. Love this idea! My children get so excited when our neighborhood hosts a community garage sale because they get to have a lemonade stand. Upon earning money, my kids really enjoyed getting involved. When my son heard about his teacher going on a mission trip, he asked if he could help with a lemonade stand to earn money for her trip. Of course, we pulled it together to support her. Thanks for sharing this series, this option is my favorite thus far. I have never tried this but I do know of a lady who makes a killing selling pumpkin rolls to hospital employee’s every year around this time. She works in the same department as my husband and brings samples and a printed list for taking orders. She sells 100’s of rolls between all the different departments she leaves the samples and lists at. I think she must use a church kitchen to do it in though since our county is strict on commercial kitchens for selling food to public, but using a church kitchen often counts as one so people often pay the church a small fee to use their kitchen for a day. I’ve thought of doing this for extra money. Do you know what she charges for this? Do they have to be refrigerated? Great post! My occupational therapy assistant program did this and raised…..$320! in 7 hours! We are using this to go on our ILOTA trip in Naperville, IL in November. We originally paid $60 registration fees and now after the sale, we are really only paying $25 🙂 There are only 9 out of the 15 sophomores(my class) going and zero freshman. This may not be allowed in all areas. Some locales are very strict about food sales especially out of homes. You may be required to have a vendor’s license and inspection from the health department. Yes, even for a “lemonade stand”. Another way that we’ve seen work is to team up with a group and sell at an event. Our local homeschool rocket club had a launch date and a boy scouts troop sold drinks and snacks. It was a cold morning and warm afternoon in a big field, so hot coffee, snacks and soda later were great! Wonderful idea! I’ve wondered how difficult it would be to get permission to do that- I need to ask at one of the events we attend. Thank you for the suggestion! I love this idea and think my children and I might do this soon. Davonne, what did you keep in the crockpot? I am trying to figure out the logistics as far as can you make the hot cocoa and keep it warm in the crockpot without it going funny? Do you have a good simple recipe for your hot cocoa? Thank-you for posting this. I had called my health department a couple months ago to see what the rules were for my area ,because I was considering something similar ,but this idea is better,thanks again! The crockpot held hot apple cider, but we often keep hot chocolate in there instead. It just needs stirred before serving. Davonne – Thanks for the great post. 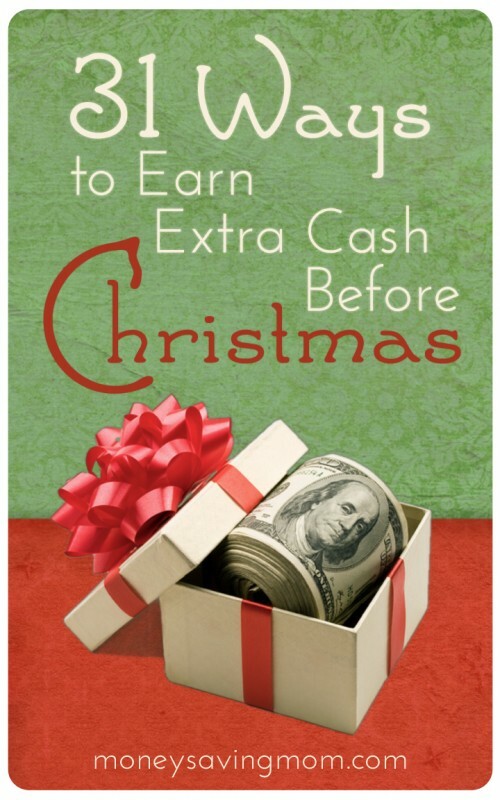 One of the side benefits of this type of program is helping your kids to learn about money. They can see with their own eyes how to make something, charge for it, deal with customer service, and much more! This reminds me of a guest post from Hope a few days back. She talked about how she let her teenager balance their checkbook. So many opportunities to teach kids about how to use money responsibly! I agree! The financial teaching benifit is worth more to me than the money itself. Thank you for your input! Great idea as a fundraiser for charities, but I wouldn’t feel comfortable doing this just to make extra cash. I just don’t see many people interested in buying random homemade foods alongside the road if it isn’t for a good cause–I know I wouldn’t. This is illegal in some states. It is illegal in Oklahoma to sell any food item that has not been prepared in a commercial kitchen. Believe me, I have looked into this, I would LOVE to sell awesome decorated cakes to friends or receive a little something for making them for church baby showers and stuff. Unfortunately, I cannot even ask for the cost of ingredients!